Here it is! The skateboard that started the craze for the plastic skateboard. It's the Penny Original Skateboard, of course. We previously rode the Original's bigger brother the Penny Nickel Skateboard. The Nickel, whilst compact, is quite a bit larger than the 22 inch Penny Original Skateboard deck, measuring 27 inches in length. It's always a lot of fun to ride and makes a fantastic commuter. But we've now realised that there's a place for both boards and so it's not so much a Penny Original vs Penny Nickel debate, as they have different characteristics in their own rights. Probably one of the most iconic things about Penny skateboards are the colours and designs they're available in. There are too many variations to mention all, but nobody should struggle to find a design they like, or one that is unique and personal to them with the online Penny skateboard builder. The wheels, trucks, hangers bolts, deck and optional grip tape are all able to be pieced together in different colours and in some instances different styles and prints too, like our deck. This aspect of personalisation is something we really like about the Penny skateboard culture that is now confidently established. 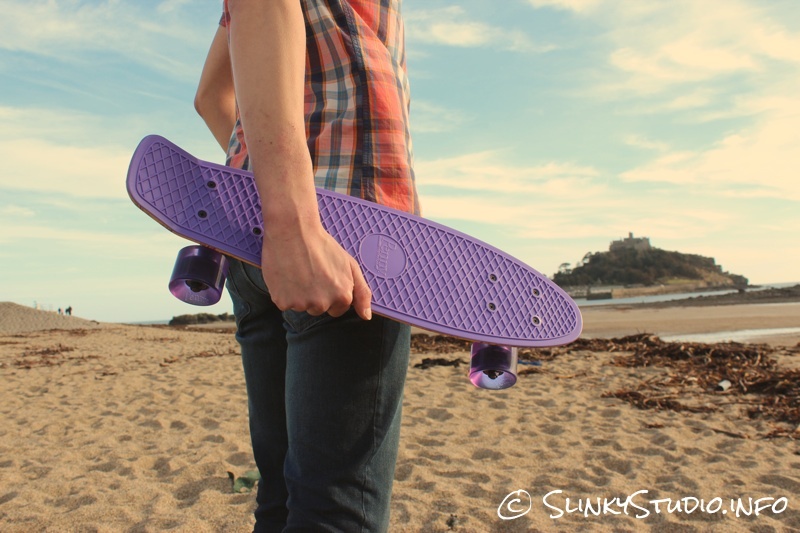 And Penny are getting more and more creative and diverse with the design characteristics of their boards every year. The deck on the Original measures 22 inches/55.8cm in length and at its widest point it measures 6 inches/15.24cm. The compactness of its design means you can actually put the Penny Original Skateboard into a regular sized backpack, zip it up, and go about your day. Its dinky size means that avid longboarders like ourselves will find it very peculiar to ride initially, but after a few hours of riding it becomes second nature. The cute kicktail is ideal for resting your back foot on for comfort and a locked-in ride. The naked deck with no grip tape actually boasts a compelling grip and we felt stable when whizzing along at great speed and even when performing tricks; but the option to have grip tape can always be added if you require further support. The deck achieves its grip via the diamond pattern on the deck's surface; this pattern does attract dirt which gets trapped within it, but it usually falls out just from riding the board. What may surprise you is that the plastic deck is not a weak opponent to the wooden decks; with the plastic formula Penny have used here being structurally solid and brushing off serious impacts. The worst damage we've been witness to are scrapes where the plastic has met friction. This plastic formula is a challenge to wooden setups, with even the flexibility of the Penny Original being quite loose when jumped on. High performance rugged A grade cast aluminium powder coated 3 inch Penny trucks, with 87A bushings feature on the Penny Original Skateboard. The bushings are rigid when travelling in a straight line, which is fantastic for cruising. But when you want to steer the board, a light shift in weight will engage swift, gentle and agile turns. The board's different components have been harmoniously designed to try and minimise oversteer, but sometimes wheels can come away from the ground and cause the board to flip over if you go at it too hard. The turning capabilities are what truly enables the Penny Original Skateboard to be such a fantastic commuting board. Yes it's ultra-compact, but that small footprint on highly populated city sidewalks would prove pointless if you couldn't acquire sharp turns to get around people and general obstacles in your path. In addition, its kicktail also makes riding up onto curbs unchallenging. Of course, this part of the board's riding style makes the Penny Original outrageously fun to ride. It delivers a unique and very thrilling surf-like feel, which is brilliantly demonstrated when zigzagging back and fourth on the board. The wheels are 59mm urethane cored Penny wheels. They're rated at 78A, so they're actually softer than the 87A wheels equipped on the Penny Nickel Skateboard. However, we couldn't distinguish any differences in the softness of the ride. Travelling over densely textured surfaces wasn't bone shattering and wet terrains are also not an issue. A few energetic pumps and the Penny Original will whip along. Abec 7 bearings are used within the wheels and they definitely aid momentous speed and sprightly acceleration. Cruising along on the asphalt or boardwalk in the summer is so refreshingly calm and crisp. We automatically reach for the board when off out as a faster and more enjoyable replacement to walking. The feeling and overall riding style of the Penny Original can be summed up in one word, fun. Having a kicktail means tricks are on the agenda. Flips, ollies, ramp usage, shredding bowls, sliding and more are all accomplishable with the Penny Original Skateboard. The lightness and compactness of the board enables the learning and executing of tricks to be fairly easy and a huge amount of fun. Because the wheels have a bounce, landing from an ollie or a flip onto hard surfaces is tolerable. (Although the deck has some flex, we wouldn't want to land with it on a setup that had harder wheels.) Being on the small side, the Penny Original Skateboard wasn't intended for bombing down hills and we didn't even bother engaging in such activities. But it's more than equipped for gentle slopes, along with some active carving. The Penny Original Skateboard is a viable alternative to walking for your commute to work and school. It's a dazzling skateboard with its own style in both design and riding.